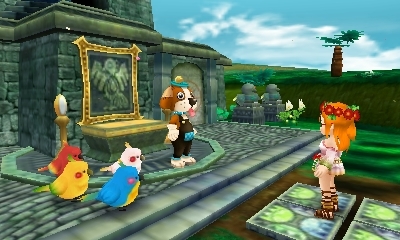 As you walk into Lulukoko you'll spot Woofio being followed by some parrots. You follow them to the ruins, where Woofio explains he's working on becoming a better animal trainer and just finished warming up his vocals to practice his commands. He asks if you'd like to give it a try too! Of course you would! Woofio explains that to become a great trainer, you need to understand the animals' feelings. He shows you by singing along with the parrots, then asks you to give it a try. It takes a little longer, but the parrots eventually respond to your singing too. Next, the two of you try to bond with the turtles by walking just like them on all fours and low to the ground. Then you stand up nice and tall by the Spoonbill. Well, don't you feel silly! You lose your balance for a moment though. Once your training is over, Woofio says that you did a good job. You've the most potential of any human he's seen so far! He says you've started on the road to earning your animal trainer license. Woofio takes you to the edge of the water and says that next you're going to try to be a shellfish. He heads into the water and sits in it like a clam would do. You'll need to know how to do this correctly if you want to be a proper animal trainer, and he invites you to try it out. You can't act like a clam in the water! Woofio apologizes for forgetting that normal people can't live in the water like that. He becomes embarrassed and admits that he needs to practice communicating with humans.